Some green manures can be sown in late summer or early autumn and left to grow over the winter. Clovers or rye grasses may be perfect for this and will have time to grow before digging in during early spring. 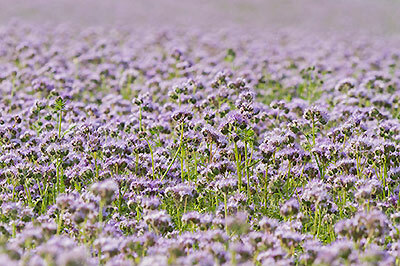 If you have a new garden or a barren plot that you don't intend to cultivate or plant for at least a year, then one of the longer-term green manure crops, such as alfalfa is a good idea. If you need to use the area earlier than expected, green manures can be dug in at any time. Just leave a few weeks for them to rot down before planting. Clovers fix nitrogen from the air, they can help weed suppression & improve the soil structure. Clovers roots penetrate deep into the soil and help to improve its structure by binding soils together. Green Manure is a crop that is grown to benefit the soil. It improves the health of the soil and subsequent plants and it can save a fortune on compost. Once the seeds have grown and the plants broken down they will add organic matter to the soil. Red, White, Wild white & Alsike. Alfalfa lucerne seed for green manure. Sow at 2.5 grams per square metre. Italian ryegrass seed for green manure. Sow at 4.5 grams per square metre. Sow from spring to early autumn. Takes up to 2 months to establish. Sow at 1.0 grams per square metre. Dig in just before flowering.